If an adult in your life has neck cancer, you may want to learn more about it. This page has information about neck cancer, its types and what to expect. First, you should understand what cancer is. Cancer is a disease caused by abnormal cells that grow too rapidly. Our bodies are made of cells so tiny you need a microscope to see them. Cancer cells don’t look or act like normal cells, and they don’t allow our normal cells to work properly. There are many different types of cancer that can grow anywhere in the body. Some people with neck cancer go to a doctor because they feel a “swollen gland” or lump in the neck. It is important to remember that a lump in the neck may not be cancer. Lymph nodes can be enlarged for many reasons, including inflammation and infection. Also, many benign (non-cancerous) tumors can be found in the neck (e.g., schwannomas, neurofibromas, paragangliomas and others). Actually, most lumps in the neck are not cancer. The term “neck cancer” is not a very specific term. In most cases, it refers to cancer cells that have spread into lymph nodes within the neck from a primary tumor site. Lymph nodes are located throughout the body, including the neck. Lymph nodes filter fluid accumulated from a nearby part of the body and help the body fight infections and cancers. Cancers from one site in the head and neck can drain into lymph nodes and lead to growth of cancer within the lymph node. These are called metastatic lymph nodes. Just about any cancer in the head and neck region can spread into lymph nodes in the neck. More rarely, cancers from other parts of the body can spread to the neck. In those cases, the mass is usually found in the lower part of the neck just above the collarbones. Cancers such as lymphomas and sarcomas can start in the neck, and they are treated somewhat differently. 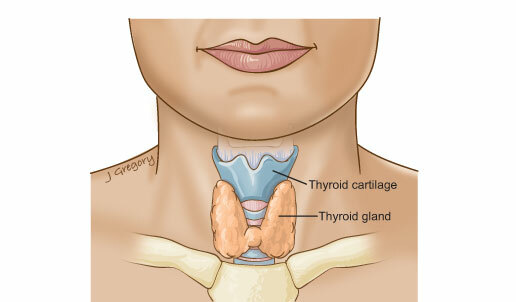 Thyroid cancers start in the thyroid gland and are considered separately. Your loved one may have noticed a lump or swelling in or around his or her neck and brought it to the attention of a doctor. Not every lump or bump is cancer, but it is a good idea to ask a doctor when you are not sure. The earlier the cancer is found, the better the outcome. To understand neck cancer, you need a basic understanding of the anatomy (parts) of the head and neck. The neck connects the head to the body and is a very complex area. In the front, the neck goes from the bottom part of the mandible (lower jaw) to the bones of the upper chest and shoulder (including the sternum and collarbones). In the back of the neck, there is mainly muscle and, of course, the spine. Basically, the neck is a passageway for air, food, liquids, blood and more to travel from the head to the body and vice versa. This includes blood vessels, nerves, lymphatics and pathways for breathing and eating. The neck is more than just a passageway, though; it contains organs such as the voice box (larynx), thyroid gland and parathyroid glands as well. The submandibular salivary glands and the tail of the parotid salivary glands are also located in the neck. Sternocleidomastoid muscle: This is the big muscle on either side of your neck that protects many important deeper structures such as the carotid artery and jugular vein. This muscle goes from the skull just behind the ear (mastoid bone) all the way down to the sternum (breastbone) and clavicles (collarbones). You can feel this large muscle in your neck, especially when you turn your neck side to side. Other muscles are shown in the diagram below. Salivary glands: The submandibular salivary glands and tail of the parotid salivary glands are located in the neck. If the cancer is in one of these glands, see Salivary Gland Cancer. Carotid sheath and major arteries and nerves: This envelope of tissue includes three major structures: the carotid artery, internal jugular vein and vagus nerve. Just behind the carotid sheath sits the sympathetic nerve plexus, which helps with blood pressure control and other important functions. There are also other major nerves such as the hypoglossal nerve (which controls tongue movement) and the spinal accessory nerve (which controls neck and shoulder movement). 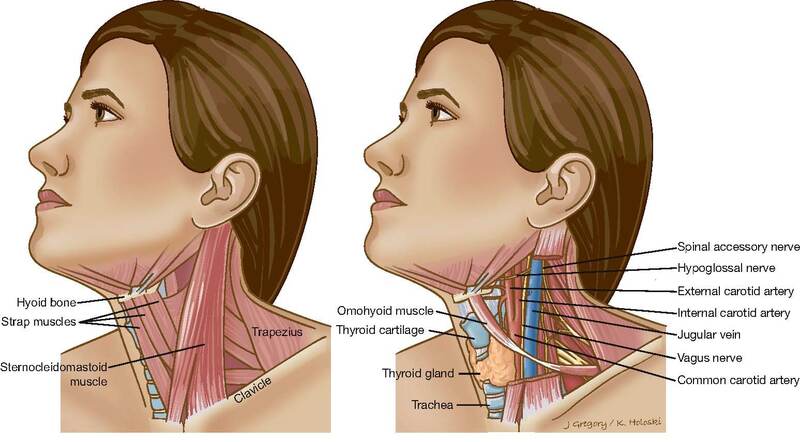 Thyroid gland: The thyroid gland is located at the midline of the neck, under the skin and a few layers of thin muscles. This gland secretes a hormone important in regulating many functions of the body. The thyroid gland has a right and left lobe as well as an isthmus (and occasionally a prominent pyramidal lobe). Also, next to the thyroid gland are four parathyroid glands, which are critical to regulate levels of calcium in the blood. Trachea and esophagus: These are passageways for breathing and eating. The trachea sits in front of the esophagus. It starts below the voice box at the level just below the cricoid cartilage. The esophagus is hidden behind the trachea, and it is the tube through which food and liquids travel from your mouth into the stomach. 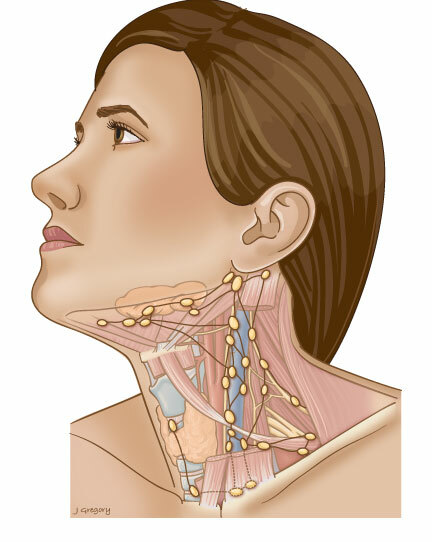 Lymph nodes: Lymph nodes are located throughout the body, including the neck. Lymph nodes filter fluid accumulated from a nearby part of the body and help the body fight infections and cancers. Cancers from one site in the head and neck can drain into lymph nodes and lead to growth of cancer within the lymph node (called metastatic lymph nodes). The lymph nodes in the neck are classified into different regions. This helps doctors talk about and research spread of cancer into the neck. You may want to know what caused the neck cancer. The short answer is that we don’t know. You can be sure that you did nothing to cause it. Also, it is not contagious (you can’t catch it). Since neck cancer is not a specific type of cancer, the cause of the cancer in the neck depends on the primary type of cancer, or where the first tumor appeared. You can look into the causes once you know what type of cancer your loved one has. See Metastatic Lymph Nodes if it is cancer spread from another site. See Advanced Thyroid Cancer if it is a thyroid cancer. See Salivary Gland Cancer if it is a salivary gland cancer. See Skin Cancer if it is a skin cancer. The cause of sarcomas is not always known, but previous treatment of a cancer with radiation can increase the chances of getting a sarcoma in the neck. Also, viruses, immunodeficiencies and genetic factors can cause sarcomas.1 Fletcher CDM, Rydholm A, Singer S, Sundaram M, Coindre JM. Soft Tissue Tumours. In: Barnes EL, Eveson JW, Reichart P, Sidransky D, editors. World Health Organization classification of tumours: pathology & genetics WHO Classification. Lyon: IARCPress; 2005. The cause of lymphoma is not really known. Genetic factors are probably related. Thyroid cancer is sometimes due to genetic (inherited) influences. Exposure to radiation and other factors might increase the risk of thyroid cancer as well. However, sometimes people just develop thyroid cancer, and there is no known cause. Cancer of the neck is seen in two ways: there is a lump in the neck, or imaging studies for another reason show a mass in the neck that needs to be looked at further. Also, skin cancers might be noticed as a new or changing spot on the skin of the neck. Those with lymphoma are typically younger than most with head and neck cancer. They might have general symptoms in addition to the neck mass, such as fevers, chills, night sweats, fatigue and weight loss. There may also be enlarged lymph nodes in the body. But don’t jump to conclusions. Your loved one could have one or more of these symptoms but NOT neck cancer. There are several non-cancerous causes of the same symptoms. That’s why it is necessary to see a specialist. Do you have any changes in your vision or hearing? Do you have a change in your sense of smell? Have you been exposed to a cat? Have you travelled anywhere or been around anyone with an infectious disease such as tuberculosis? After getting background information and doing a physical exam, the doctor will look at the results of any tests the patient has already had. Finally, the doctor will make suggestions about next steps. This will probably include more tests and doctor visits. If the symptoms haven’t been present for very long, or if the history and physical examination make the doctor less suspicious that the lesion is cancer, the doctor might try some medications and rehabilitation before jumping to a diagnosis of cancer. However, if the doctor is suspicious, he or she may choose one or more of the following actions. Imaging refers to radiologic studies, or scans, that make pictures of the structures inside the head and neck. 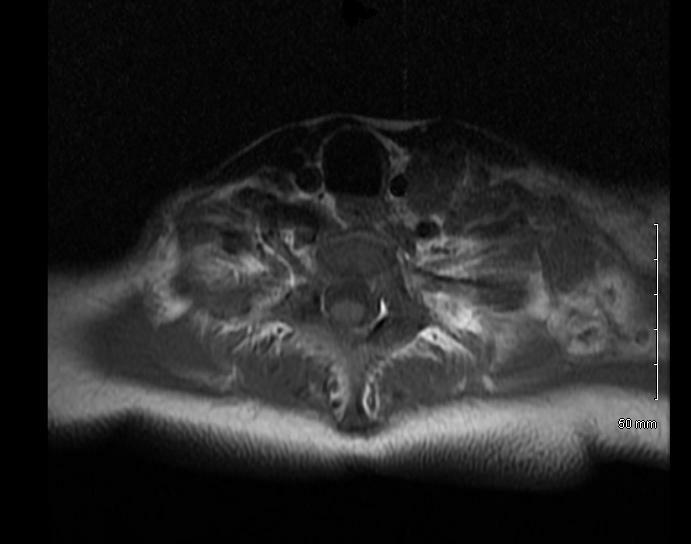 In general, imaging might not be necessary for small tumors that can be easily seen by the doctor. For larger tumors, or tumors in locations difficult to examine, the doctor will probably order some sort of imaging to get more information about the tumor location to see if the tumor has spread to nearby lymph nodes. An important reason to get a scan for sinonasal tumors is to see if there is any evidence of spread into nearby structures. Spread into other structures will influence what treatment the doctor recommends. Some surgeons also say getting some imaging (pictures of the inside of the head and neck) will lower the chance of surprises in the operating room. Imaging will also give some clues about whether the tumor is really cancer. This will prepare the patient and the surgeon for what to expect during surgery. The two main types of imaging used in the U.S. are CT scans and MRI scans. A biopsy is the main way to find out if a growth is cancer. For a biopsy, the doctor takes out a small piece of the lump or the entire tumor. Another doctor, called a pathologist, then looks at the sample under a microscope to see if it is cancer. Doctors often do biopsies because they can usually be done quickly and safely. The doctor can sometimes do a biopsy during the first visit and there is a very low chance of anything going wrong. Some tumors can be biopsied in the office with a little numbing medicine (either a spray or a tiny injection or both). It usually takes only a few seconds to do the biopsy. In some cases, however, the doctor may want to do the biopsy in the operating room, especially if there is concern about involvement into the neck or throat. A biopsy can help the doctor plan the surgery if the decision is to take out the whole tumor. A biopsy can also prevent unnecessary surgery. As good as biopsies sound, there are a few problems. First, biopsies are not 100 percent accurate. A biopsy could show that a growth is NOT cancer when it really is; this is called a false-negative biopsy. A false-positive is also possible when the biopsy seems to show that a growth is cancer but more testing shows it isn’t. Sometimes doctors can’t be sure from a biopsy. Now the doctor will need to figure out what type of cancer it is. He or she may be able to tell from biopsy results. The doctor may also want a second opinion from a specialist to be sure. Remember, not all lumps and bumps in the neck are cancer. Most growths are benign (non-cancerous), and some tumors are on the borderline between benign and malignant (cancerous). The best way to classify neck cancers is to find out if it is a cancer that started in the neck or has spread from somewhere else. Salivary gland cancer: The submandibular gland is technically located in the neck. Submandibular gland cancer can present as a neck mass just under the jawbone that doesn’t go away. Also, the tail of the parotid gland is in the upper neck just behind the angle of the jawbone; so a cancer there can also show up as a neck mass. Finally, a lymph node with a salivary gland cancer (metastatic lymph node) is another way that salivary gland cancer could show up in the neck. 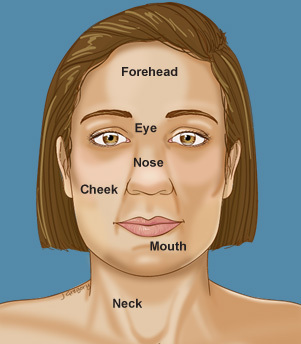 See Salivary Gland Cancer and Metastatic Lymph Nodes to read more about those. 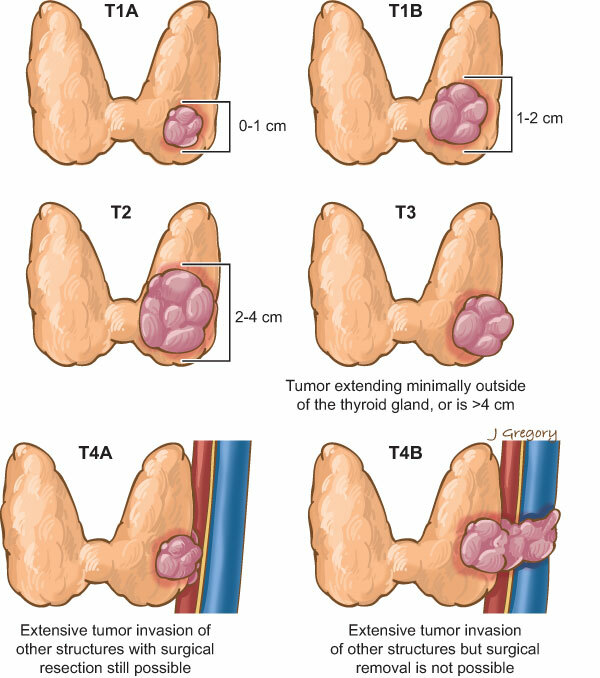 Thyroid cancer: The thyroid gland is located in the central neck, just under the voice box (larynx) and over the top of the windpipe (trachea). The thyroid gland can usually be felt in that area. See Advanced Thyroid Cancer to learn more. 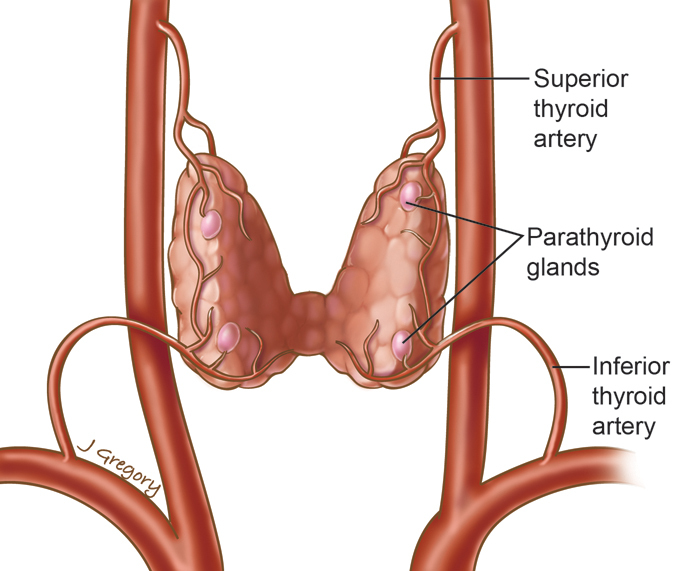 Parathyroid cancers: These cancers are very rare. They are associated with very high levels of calcium and parathyroid hormone in the bloodstream. Sarcomas: A sarcoma is cancer in the neck that arises from somewhere other than a lymph node, such as bone, cartilage, muscle or fat. Some examples include Ewing’s sarcoma, rhabdomyosarcoma, liposarcoma and fibrosarcoma. In addition, there are several kinds of tumors in between benign (non-cancerous) and malignant (cancerous), or intermediate state (either locally aggressive or rarely metastasizing). An example of this is Kaposi’s sarcoma. Kaposi’s sarcoma (KS): This cancer is linked with a virus called HHV-8. It can present anywhere in the body, including the skin, lining of the mouth or other parts of the breathing or eating tracts. Treatment involves getting the immune system into better shape (such as starting anti-retrovirals for AIDS-associated KS, or chemotherapy if it is spread throughout the body). Lymphomas: This is a cancer of white blood cells called lymphocytes. Lymphoma is the most common cancer of the neck in children.2 Cunningham MJ, Myers EN, Bluestone CD. 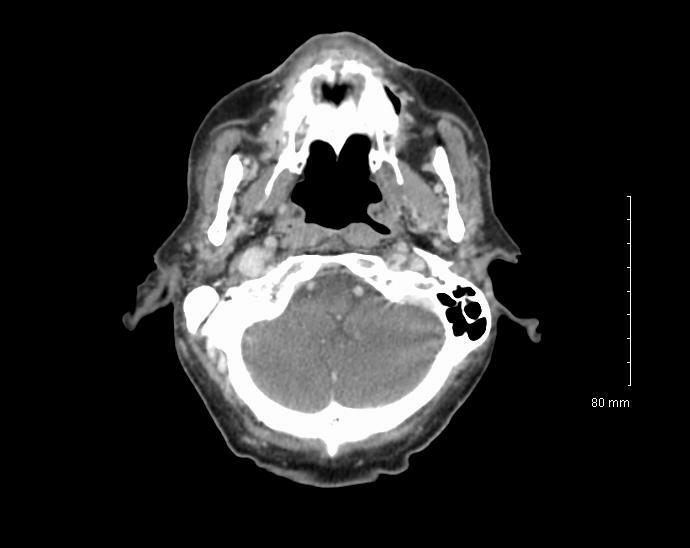 Malignant tumors of the head and neck in children – a 20 year review. International Journal of Pediatric Otorhinolaryngology. 1987;(13)3:279-292. Non-Hodgkin lymphoma is a term that includes about 30 different types of lymphomas. Hodgkin lymphoma is considered a different type of lymphoma because it behaves so differently. Surgery might be necessary to help with the diagnosis, but treatment is typically either radiation or chemotherapy. Skin cancers: Obviously, since the neck is covered with skin, skin cancers can appear there as well. The neck is often exposed to sun, which is a major cause of skin cancer. See Skin Cancer to learn more. Aggressive benign tumors: There are a few kinds of benign (non-cancer) tumors that can behave aggressively and should be treated. These tumors are usually treated by surgery, but in some cases radiation or chemotherapy are used. For example, desmoid tumors, paragangliomas, vascular malformations and hemangiomas are all aggressive benign tumors that your doctor may treat as if they were cancerous. 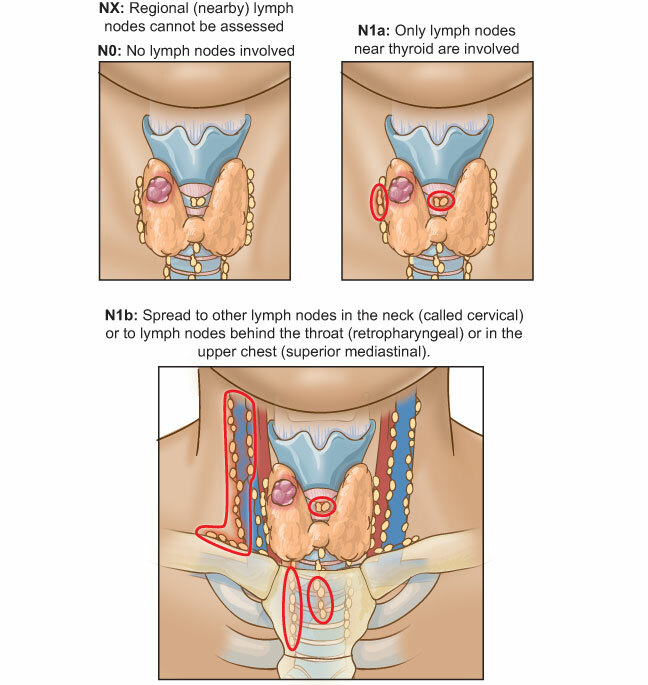 Other cancers of the neck spread into lymph nodes in the neck from another site. These are called metastatic lymph nodes and are the most common types of cancers in the neck. Distant metastatic cancer: Cancers spread to neck lymph nodes from a region below the collarbones such as the lungs, stomach, kidney, testicles or just about anywhere else. The doctor will determine the treatment for the cancer based on the category, grade and stage of the tumor. The final step before treatment is identifying the stage or the extent of the cancer. This will be based on all of the available information. Stage is based on the physical exam, imaging studies, laboratory work and biopsies. Like with all cancers of the head and neck, doctors in the U.S. use the AJCC Cancer Staging Manual (7th Ed) to figure out the stage based on three factors. Based on a physical examination and review of any imaging, the doctor should be able to assign a T stage that falls within one of the following categories. Tx The main tumor cannot be assessed. T0 There is no evidence of the main tumor. T1a The main tumor is 5 centimeters or less at its largest point (and is superficial). T1b The main tumor is 5 centimeters or less at its largest point (and is deep). T2a The main tumor is more than 5 centimeters at its largest point (and is superficial). T2b The main tumor is more than 5 centimeters at its largest point (and is deep). Next, the doctor will use all the available information to figure out the N stage. This is based on the assessment as to whether the cancer has spread to lymph nodes in the neck. Nx The regional lymph nodes cannot be assessed. N0 There is no spread into the regional lymph nodes. N1 There are regional lymph nodes involved. M0 No spread to distant sites. M1 Spread to distant sites. Let’s look at the types of treatments available. The main treatment for almost all neck cancers is complete surgical removal of the tumor. The surgeon will cut out the tumor plus a little bit of normal tissue around it to be sure he or she gets all the cancer. Another doctor, called a pathologist, will look at the entire tumor to identify a more exact stage for the tumor. This report, called the pathologic stage, can help the doctor decide if radiation and/or chemotherapy are needed. Radiation therapy kills cancer cells with high-energy radiation such as X-rays or gamma rays. Radiation may be used as a main treatment for tumors that cannot be easily removed. The surgeon will use radiation alone or radiation with chemotherapy, depending on the characteristics of the tumor. Radiation is also often used after surgery to lower the chances that the tumor will come back. Cancer has spread beyond the head and neck. There is a T3 or T4 tumor in which surgery cannot remove all of the tumor. There is a T3 or T4 tumor that has certain bad features found under the microscope, such as intermediate or high grade. There are close margins (meaning that when the tumor was removed, some cancer cells near the edge of the tumor may have been left behind). There is growth into nerves. There is spread into lymph nodes. There is growth into lymphatics or vessels. The prognosis is a prediction of how the treatment will turn out. How likely is it that a person with cancer will be cured? Will the cancer come back? How will your loved one’s life change? These are the big questions on most people’s minds when they find out that someone they love has sinonasal cancer. The following characteristics of the cancer may affect the chances of a cure. Stage This is the most important factor that affects the chances of being cured. Cancers in earlier stages usually have better outcomes. Type and Grade The type and grade of tumor shows how aggressive a tumor is. Spread to Lymph Nodes If there is spread to lymph nodes in the neck, there is a lower chance of cure. The Tumor Margins (edges) Some would argue that the ability to completely remove the tumor is the single most important factor in whether a person will be cured. Spread into Nearby Body Parts Spread into large nerves, skin and bone have been shown to indicate a worse prognosis. In general, it is very difficult to discuss prognosis without understanding all the details of the cancer; to give a percentage chance of cure is really difficult because cancer research looks at all sorts of different types of cancers and may include patients from long ago. After making it through treatment, your loved one will need to follow up closely with the doctor. Follow-up doctor visits and testing are to make sure the cancer doesn’t come back or to catch it quickly if it does. In general, your loved one should have regularly scheduled doctor’s visits every one to three months for the first year, every two to six months in the second year and every four to eight months in the third to fifth year. After making it past the first five years, your loved one can then see the doctor once a year. 1 Fletcher CDM, Rydholm A, Singer S, Sundaram M, Coindre JM. Soft Tissue Tumours. In: Barnes EL, Eveson JW, Reichart P, Sidransky D, editors. World Health Organization classification of tumours: pathology & genetics WHO Classification. Lyon: IARCPress; 2005. 2 Cunningham MJ, Myers EN, Bluestone CD. Malignant tumors of the head and neck in children – a 20 year review. International Journal of Pediatric Otorhinolaryngology. 1987;(13)3:279-292.